In the year 1979 a group of Carlisle citizens came together to create Carlisle Elderly Housing Association Inc., a non-profit corporation, for the purpose of providing housing for seniors in Carlisle. 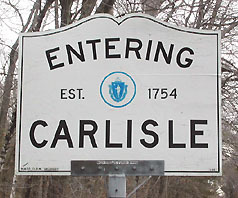 They obtained land from the Town of Carlisle and a private party - and with the aid of funds acquired from the US Department of Housing and Urban Development, USDA Rural Development, and others, it built Carlisle Village Court. Village Court is an active senior community located in the heart of Carlisle close to the library, schools and the lively center of the Town. Want to participate in community service? Become a member of the Carlisle Elderly Housing Association, Inc. Carlisle residents with an interest in senior housing issues can become members of the corporation. Members meet a minimum of once a year at an annual meeting, presently set for the first Monday in February, where they elect the corporation's Board of Directors. It is an opportunity for Carlisle residents to become directly involved with the issues of senior housing at the center of Carlisle. If you have an interest, then click on the word "CEHA" below to get the email address to which you can send an email regarding your interest. We will contact you soon thereafter. Village Court? Click on "CEHA"
you can email your comments. We will try to reply to them in a timely manner.